If you're using a connector (Zendesk, Contentful, GitHub, etc. ), you'll first need to create a file project before you'll be able to see and follow the steps below. Log in to Smartling and click your project name. From within the Project Dashboard > Next Steps, click Upload a File. Click Upload Files to add your files. Click the + sign to add more files, or simply click Upload. Click Next once your file has completed its upload. We will automatically "version" all files. To learn more about this process, see File Versioning. Once you've uploaded your files, you'll see the Job Order Summary screen, and will need to confirm the transaction. In some self-service plans (Pro and Business) you'll also have the option to use your own Translators. Before you can authorize a job order for your own Translators you'll need to invite them to your account and give them access to the appropriate language and workflow steps for them to work on. To add your own translation resource, go to Team > Add User > select Translation Resource. Click on the user name to add them to a workflow assignment. An email notification will be sent to your assigned resource. Once payment is confirmed, a message will appear that your job has been accepted. It's important to provide the Translator with as much context as possible to help them complete the job faster and with more accuracy. Add a description in the text box, then click Ok. Style Guide: Having a style guide is critical. Your style guide will apply to all your content. It describes who you are and the grammatical styles you want the Translators to use. String-level instruction: Provide special instructions for individual strings such as descriptions of how and where it appears, variables for application strings or information to clarify the strings if Translators have asked a question about it. 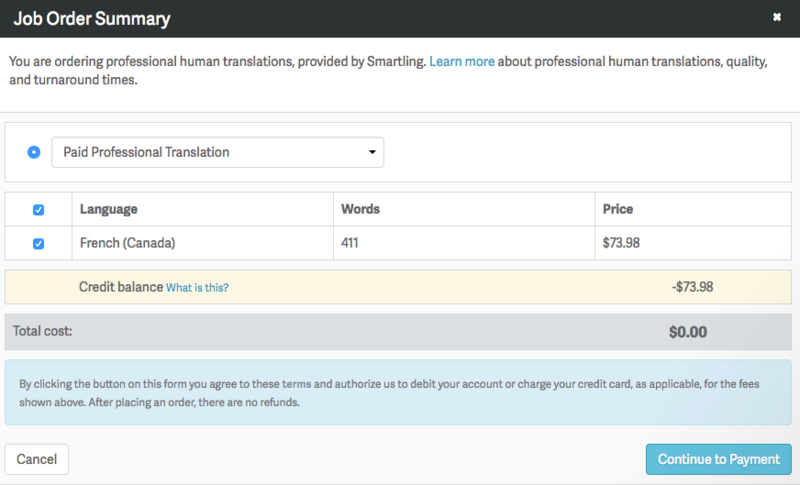 Smartling has a special "Character Limit" feature - use that to communicate restrictions on the length of a translation. In some resource file formats, Smartling automatically extracts string-level instructions. You can add string instructions from the List View or the Files page. Visual context (image context): Smartling's unique In Context translation tools will show the Translators a visual of the original content. Adding visual context to your strings can help the Translators understand exactly how the string is used in the context of an app, web site, or document. File instruction: You can add instructions that pertain to all the strings in a specific file on the files page. Order description: When you confirm an order we will ask you for a description of that order. This description only applies to that specific order. Once a file has been uploaded, you can click the name of the file, and Add file instructions. Want to know more about translation turnaround time? See the Professional Human Translation page.